We hope that our very large garden will attract someone to buy the property here in Abergavenny – gardening has always been a passion and there is nothing like going into your own orchard and eating an apple, or pear picked straight from the tree. The orchard and the entire kitchen garden is surrounded by a high wire fence that has been buried in the ground to stop foxes and rabbits from getting into the garden. The luxury of being self sufficient also allows you the pleasure of enjoying the quirky characteristics of the providers of your food. Geese and ducks are always entertaining and provide eggs and keep the grass short as well as the elimination of buttercups which geese love! 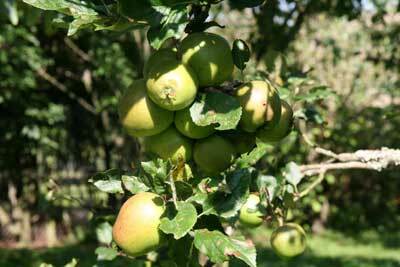 Apples that should have been thinned out earlier in the year, but we forgot to do this. This is a modern version of the cox apple – September picture. There were some wonderful varieties of apple in the old garden, but time has taken its toll and there is only one mature tree left and a side shoot on another one which the previous owners called ‘The Old Man’. The child is beginning to produce fruit. There were two magnificent trees – Beauty of Bath I believe – a wonderful apple – picture book red and very very early. These sadly have gone. The new orchard, now mature enough to produce more fruit than any family could use for domestic needs, but a side line could be ventured into with jams and chutneys. The cherry trees have grown very tall so challenging to pick the fruit, plums, pears, greengage (my favourite of all), raspberries and japanese wine berries are all prolific. Japanese wine berries – just before they start to produce fruit are so pretty at this stage – the flowers are insignificant – little white blobs, but the fruits, which are not common, are delicious – a combination of texture and flavour – the slightly sharp taste of red currants and the soft texture of raspberries. They are very decorative – bright red and beautifully translucent. Japanese wine berries were planted in the aviaries, but they have escaped all over the garden. 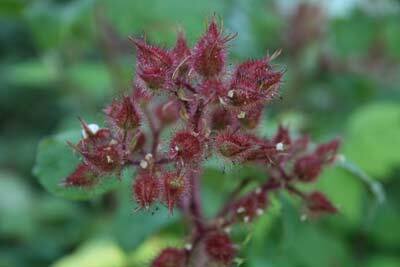 This is a fruit that is not often found in gardens and rivals the raspberry – of which there are several species including an autumn fruiting one. These need to be moved somewhere where they can be caged as the birds feast on these as soon as they appear. Another fruit that is spreading all over the garden is the wild strawberry – for jam making that will set better than any ordinary strawberry jam – wild strawberries are brilliant. 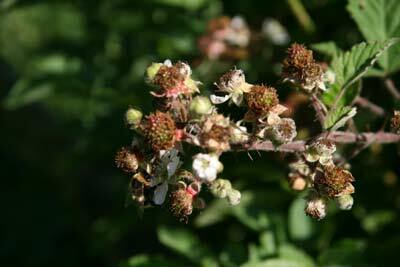 AND the very best home made ice-cream is one laced with piles of wild strawberries. The birds are not so much of a problem with these – our Staffordshire Bull Terrier discovered the joys of picking fruit at a very young age. Blueberries for instance come on bushes – not in packets. 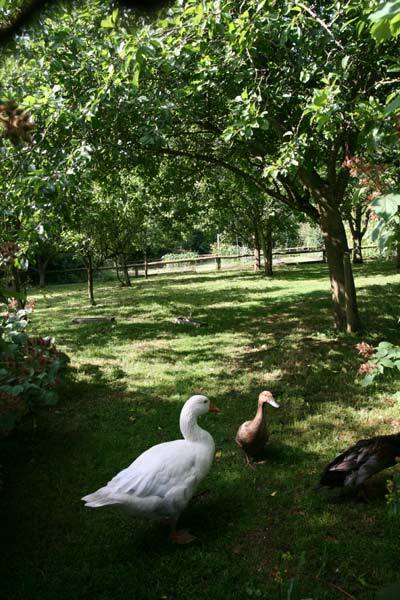 Bantams are flighty – so they are kept in the aviaries that have been built on two sides of the orchard. The original intention was to grow soft fruit in these cages and allow the birds in once the fruit was over. This plan did not work because the richness of the soil after a winter of chicken muck – made the fruit bushes too delicious for the aphids and gradually the trees grew bigger and the shade was too much. 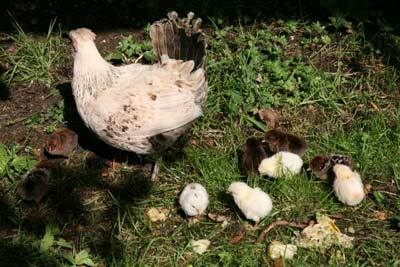 Chickens are very useful – they eat up waste from the kitchen and convert it into neatly packed food parcels – fit for human consumption – eggs – and they are totally organic if you do not use any chemicals in the garden. Then there is the bonus of food from the wild. We have actually planted elderflower in a number of places because there is nothing nicer than homemade elderflower cordial for refreshing summer drinks – dried flowers can be used later in the year or more ambitiously elderflower wine. 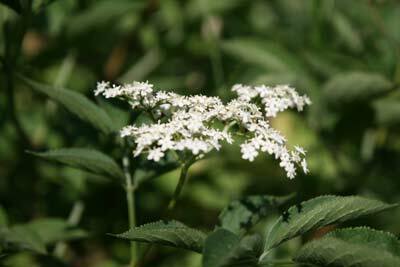 Elderflower added to gooseberry or greengage jam gives a luxurious exotic touch to the preserve. The berries make a rich addition to jams and pies. Blackberries added to the apples from the orchard evokes memories of childhood pies. Nettles (kept controlled in small patches) fabulous for soup and there is a mass of wild garlic – a luxury in gourmet restaurants but free to the lucky gardener who has it growing abundantly. Geese make good guards as they will shout a warning if there is an intruder – if hand reared they become devoted friends. Isn’t he beautiful and doesn’t he know it. 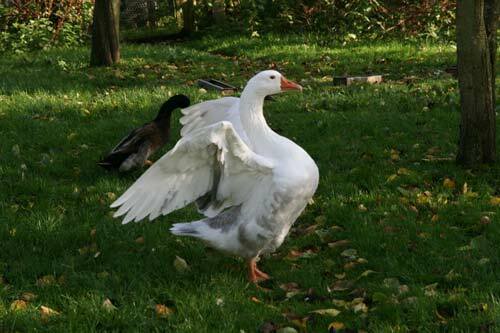 Jeramiah is a Pilgrim goose – so named as being of the stock that originally went to America with the Pilgrim Fathers. He has a bit of a mental problem – he thinks he is a duck which made us think that perhaps his adoptive mother was a duck. The goose house – not that it has ever been used because he does not like being indoors. 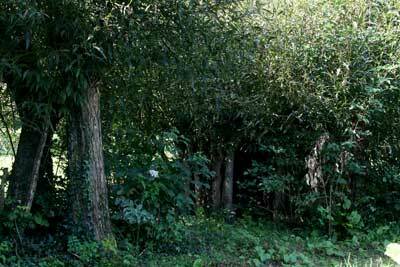 There are two of these built with live willow trunks that have grown so big that they have almost melded into each other. They can be left to grow into large trees, but better clipped every now and then otherwise the roof will get pushed off. One is now used for tools and the small mower which is used for the paths in the potager. Next to the polytunnel, which houses the swimming pool, there is a large area that we had planted up with lavender that we used for making lavender bags for the business. It is organically grown – although not officially soil tested. 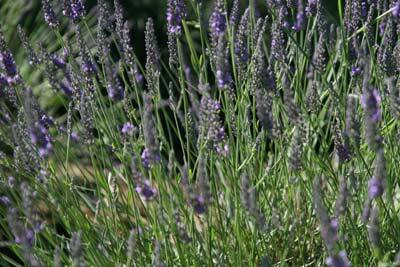 The variety is Grosso – a commercial variety which produces long spikes of rich lavender flowers that are generously laden with oil and long lasting perfume. The plants have got rather old now and new cuttings are being grown to replace the old ones – they grow very easily from cuttings and it would be worth putting plants in other parts of the garden the more to enjoy the heady perfume as you walk around the garden. And bees just love lavender flowers.